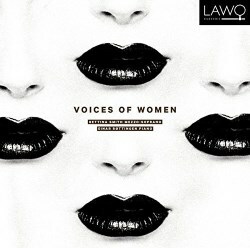 When I first unwrapped this CD I thought that it would be music by women for women but I was quite wrong. The three composers are all men of three different generations. So, what about the texts? Well the songs by Fartein Valen are settings of Goethe. Ophelia’s Song sets Shakespeare and the piece by Ketil Hvoslef is from the apocryphal gospel of Mary Magdalene probably written by a man in the second century. Fartein Valen, as heard from these early songs was an admirer of Schoenberg or more probably Berg. Both sets of songs are practically atonal. The Op. 6 ones are aphoristic in a Webernesque sense and the textures are contrapuntal and quite thin. In Op. 7 songs Valen thickens them up and adds intensity. The melodic line, whilst not easy to sing, is written sympathetically and paints some words effectively but I’m sorry to say that I failed to warm to these five songs. In Hamlet Act 4 Scene 7, Queen Gertrude, in describing the death of Ophelia says “Which time she chanted snatches of old tunes / as one incapable of her own distress”. In his setting entitled Ophelia Scene, Jostein Stalheim attempts some simple folk-like tunes suitable for lines like “Tomorrow is Saint Valentine’s Day” and “Bonny Sweet Robin is all my joy”. In contrast some other of Ophelia’s songs are quite bawdy and Stalheim attempts to put all this across in a quick changing mix of styles. Sometimes the text is punctuated by spoken lines, sometimes just by spat out consonants or vowels, which make no logical sense. Text is repeated slightly at random and the tonal language may be bi-tonal, diatonic or atonal. Apparently Stalheim often writes like that but he seems to have found an ideal vehicle for his taste in this work. I found the piece both moving and yet overly mannered, frustrating and yet it also got under my skin as the booklet notes said it might. It was as a result of hearing Stalheim’s work and being much taken by Bettina Smith’s dramatic mezzo that Ketil Hvoslef asked for a text to set for her to sing. She came up with part of a so-called Gnostic writing resulting in From the Gospel Mary Magdalene. His setting shares with the Stalheim a use of the text which is broken up, slowly delivered and often repeated before moving on to the next section — one which only slowly unfolds. The result is an austere and concentrated, lengthy scena which needs much attentiveness from the listener let alone the performers. The piano part is considerably more interesting than the vocal line which is often sung on a single note. When there is a melodic leap it is sometimes emphasised by piano doubling. Harmonies are often unrelated but have a sense of magic and also of foreboding. The effect is almost trance-like. Hvoslef is not a natural vocal composer. For example his orchestral music, including his eighteen concertos and a large quantity of chamber music, demonstrates his preferences. Although Smith conquers the piece successfully, I wonder if deep down she really found it satisfactory. As a listener and a singer myself I do not. The booklet comes complete with texts in the original language and good translations. Photographs, apparently meant to be Mignon, are dotted around the pages. They are in black and white and focus on her eyes, lips or lashes; quite curious but ‘arty’. There is a very helpful essay as mentioned and the usual performer photos and biographies which are, as ever, as dull as ditch-water. A real black mark however is the astonishingly short playing time. If the music was of outstanding interest I could recommend the disc despite that but, as it stands, I’m not sure to whom this disc will really appeal.